Last week's shocking treatment of migrants by employer Byron shows how government is seeking to create an army of informants - and they're trying the same tactics in our NHS. Our Tory government seeks to create a “hostile environment” for migrants in the UK. This means that they have devolved border control from the Home Office into every corner of our lives: employment, renting, and healthcare. They are essentially creating an army of informants to dob in the most vulnerable, those who often have no legal protection. We have seen this happen at Byron. We are also seeing it happen in the NHS. Under the Immigration Act, non-EEA patients are chargeable at 150% of NHS costs. Patients with outstanding bills have their details shared with the Home Office, which can lead to requests for leave to remain being denied, or even to detention. 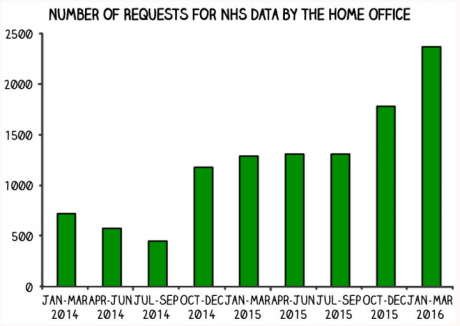 This is an increasingly popular tactic: this year, the Home Office requested three times as much data from the NHS than in 2013, as shown below. We can’t allow this to happen! The government is creating a panopticon of border control, where we police each other. This ultimately causes fear and resentment, and fuels racist ideology. Vulnerable people are less likely to access health services if they fear charges or punishment on the grounds of immigration status. This constitutes a public health and human rights issue. Byron colluded with the Home Office to avoid a massive fine. It seems they knew who was working for them illegally, and set them up for their own benefit. But healthcare workers, ideally, provide free access to sensitive, non-judgemental care. They cannot be asked to police instead of treat. At DocsNotCops, we are working to repeal the Immigration Act within healthcare. The BMA stands with us, and you can too!